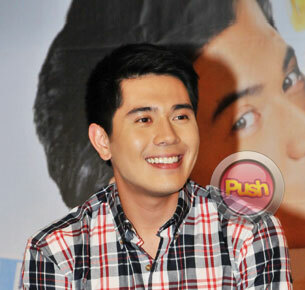 'Kahit Konting Pagtingin' star Paulo Avelino admits he wants to do more offbeat roles this year. Currently playing the role of the charming Lance Ledesma in the Kapamilya series Kahit Konting Pagtingin, Paulo Avelino admitted that his 2013 has been doing well so far. “I was very happy nung 2012 dahil I was blessed with a very good project which was Walang Hanggan. Doon tinanggap pa rin ako ng tao kahit medyo masamang tao yung character ko dun and I want to thank the audience for their support for me. Tapos ngayon meron kagad na Kahit Konting Pagtingin. I’m very blessed,” he told Push.com.ph. Aside from the romantic comedy series, Paulo said he is also busy working on other projects, most recently a Bicolano film. His leading lady in the indie film is Mara Lopez, daughter of former beauty queen Maria Isabel Lopez. “I’m doing an indie project for Cinemalaya under Alvin Yapan so abangan niyo po ang Debosyon at The Bride and the Lover this year. At abangan niyo rin ang susunod na proyekto ko sa ABS-CBN. Malapit na malapit na,” he revealed. Paulo admitted Debosyon is a different kind of acting challenge for him. “It’s actually an independent film. It’s [set] in Bicol and it’s about the Penafrancia festival. The whole film’s language will be in Bicolano and will mostly be shot in Bicol. Yung plot niya talaga is about forbidden love,” he added. Paulo said he is always on the lookout for interesting projects that will hone his acting skills. “I said yes to this project because, well, I’ve been doing indie projects since before so it’s always nice to do something out of the mainstream thing. One of my resolutions this year is to be a better actor. To strive harder and be a better actor,” he admitted. Paulo’s dream project is going to be a welcome treat for his fans who know him best as the unpredictable Nathan in Walang Hanggan. “This year I want to do a character that I haven’t portrayed in my entire career in the industry. Siguro mamamatay-tao o siguro a more challenging role. Something offbeat, something I’ve never done before,” he said.